Despite the stunning improvement in clinical outcomes from cardiovascular disease (CVD), there is no room for complacency. Indeed, CVD remains the major cause of morbidity and mortality in developed countries such as the UK, and the situation is much worse in developing nations, where an increase in premature disability and death from CVD has already occurred and is likely to accelerate. What is new about JBS3? This change in approach is based on several lines of evidence. Atherosclerosis begins many years before clinical manifestations of CVD occur, and exposure to CVD risk factors from early life has been shown to promote progression of ‘preclinical’ arterial disease.4 Furthermore, the emergence of clinical CVD seems to be related to long-term exposure to risk factors that are potentially modifiable; smoking is a classic example of damage caused by exposure over time and also of the benefits of early cessation.5 Recent evidence from genetic studies and trials shows, similarly, that a longer period of exposure to low levels of low-density lipoprotein (LDL) cholesterol could leverage larger reductions in later CVD risk.6 This suggests that prevention efforts need to begin much earlier. With clear analogies between health and wealth planning, the JBS3 approach has been described as ‘investing in your arteries’. it is never too late to gain benefit from lowering risk factors. For most people, the strongest message is the potential gain from an early and sustained change to a healthier lifestyle rather than prescription of drugs.2 A clear management algorithm is presented (see Figure 1) based on levels of short- term (10-year) risk, as well as risk over the patient’s lifetime. As cardioprotective drugs have become cheaper and have been shown to be safe and efficacious when used in the long term, there is an opportunity to broaden their use beyond previous recommendations. It is important to appreciate that there is no conflict between the JBS3 guideline2 and the recent NICE lipid guideline, which recommends reducing the threshold of 10-year risk required to prescribe statins.8 The JBS3 calculator puts the ‘statin conversation’, which is currently so controversial, into a personalised context to inform and facilitate patient choice.7 The JBS3 approach extends efforts to reduce the risk of CVD to encompass the whole adult population rather than just those at high short-term risk. * Current NICE guidance www.nice.org.uk JBS3 Board. Joint British Societies’ consensus recommendations for the prevention of cardiovascular disease (JBS3). Heart 2014; 100: ii1–ii67. Reproduced with kind permission. The JBS3 guideline makes recommendations for a broad range of practice issues that are frequently encountered in primary care.2 Of great value is the guidance to use non-high-density lipoprotein (non-HDL) cholesterol rather than LDL cholesterol. This represents the cholesterol in both LDL cholesterol and other atherogenic particles and can be calculated simply by subtraction of HDL from total cholesterol in a non-fasting sample. Evidence is accumulating that this better predicts risk and response to treatment than the level of LDL cholesterol,9 which is particularly relevant for the increasing number of patients who have metabolic derangement as a result of obesity. 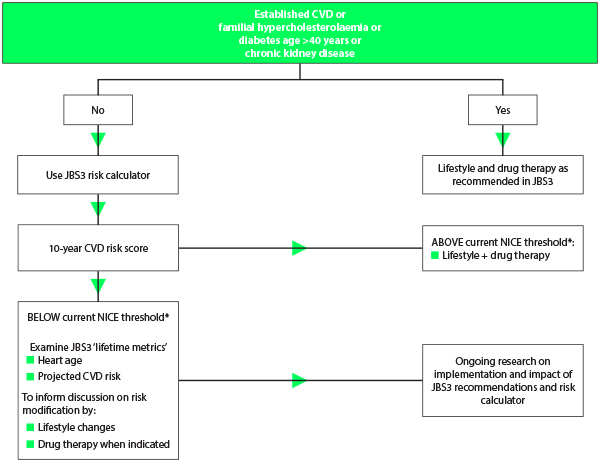 The JBS3 guideline provides clear approaches for the management of individuals with diseases that increase the risk of CVD, as well as those who have established CVD, including peripheral artery disease and stroke.2 Guidance is given on the use of genetic testing, novel biomarkers, and imaging techniques to refine estimates of the risk of CVD based on current evidence of their value. The document is easy to follow and refers, when appropriate, to existing guidelines (e.g. for antihypertensive drugs). It would take only a few minutes to read and understand the key recommendations in the JBS3 summary! The JBS3 approach should change the interaction between healthcare professionals and their patients in primary care. It aims to improve the communication of a patient’s personal risk of CVD and their own potential for benefit from early and sustained lowering of risk factors, usually by lifestyle changes. This should be more motivational than just a conversation about statins! The JBS3 risk calculator complements the NHS Health Check programme in England, which offers measurements of risk factors for CVD from the age of 40 years.10 A 10-year risk estimate at this age is of limited value, as CVD events are rare in people younger than 50 years. The JBS3 calculator is available online (www.jbs3risk.com) and in a new app—JBS3 Heart Risk—designed for use in primary care, which can be accessed from the same webpage. A ‘patient-friendly’ version is also under development. The impact of widespread use of the JBS3 recommendations will need to be tested formally, and local and national evaluation programmes are being discussed. Excitingly, the concept of lifetime risk and leveraged health gains from early and sustained reduction of risk factors for CVD can be extended to other important non-communicable diseases, such as dementia. The impact of smoking, diabetes, high blood pressure, and abnormal levels of cholesterol on cognitive function is becoming clear,11 and reductions in these largely modifiable factors may be valuable beyond the benefit for CVD. Delaying the development of both CVD and dementia, which is now the public’s greatest health concern, through similar healthy lifestyle changes could have a big impact on behaviour and adherence to treatments. The third iteration of the JBS recommendations provides the basis for renewed efforts to reduce the burden of CVD in the population, as well as its impact for patients. It emphasises the need to treat people at high risk with an intensive approach but also to empower the public to ‘invest’ in their future cardiovascular health by making early improvements to their personal CVD risk profile, which, for most people, can be achieved through lifestyle changes. The new calculator is simple and intuitive and should be used to achieve consensus with each patient on the best strategy for them to avoid or delay CVD events. Success will depend on the patients’ understanding of lifetime risk and their consequent adherence to the strategy agreed with their primary care doctor. Community interventions to reduce population risk factors through promoting exercise (e.g cycling to work) and education through programmes in schools will also be important and can be included in the health and well-being plan. Yusuf S, Hawken S, Ounpuu S et al. Effect of potentially modifiable risk factors associated with myocardial infarction in 52 countries (the INTERHEART study): case-control study. Lancet 2004; 364 (9438): 937–952. JBS3 Board. Joint British Societies’ consensus recommendations for the prevention of cardiovascular disease (JBS3). Heart 2014; 100: ii1–ii67. JBS2 Board. Joint British Societies’ guidelines on prevention of cardiovascular disease in clinical practice. Heart 2005; 91: v1–v52. Raitakari O, Juonala M, Kähönen M et al. Cardiovascular risk factors in childhood and carotid artery intima-media thickness in adulthood: the Cardiovascular Risk in Young Finns Study. JAMA 2003; 290 (17): 2277–2283. Jha P, Ramasundarahettige C, Landsman V et al. 21st-century hazards of smoking and benefits of cessation in the United States. N Engl J Med 2013; 368: 341–350. Ference B, Yoo W, Alesh I et al.Effect of long-term exposure to lower low-density lipoprotein cholesterol beginning early in life on the risk of coronary heart disease. A Mendelian randomization analysis. J Am Coll Cardiol 2012; 60 (25): 2631–2639. JBS3 website. JBS3 Risk Calculator. www.jbs3risk.com (accessed 23 July 2014). Boekholdt S, Hovingh G, Mora S et al. Very low levels of atherogenic lipoproteins and the risk for cardiovascular events: a meta-analysis of statin trials. J Am Coll Cardiol 2014; 64 (5): 485–494. NHS Health Checks website. www.healthcheck.nhs.uk (accessed 23 July 2014).